Can Guava Leaves Really Help Healthy Hair Growth? What Are the Benefits of Guava Leaves? Hair loss affects more than half of middle-aged men and women. Although hair loss is a normal part of aging, it doesn’t mean it isn’t frustrating or embarrassing to deal with. The level and severity of hair loss can be both minor and severe, ranging from thinning hair to large, visible bald spots or permanent hair loss. So, if you suffer from hair loss and are actively seeking a hair loss treatment, you aren’t alone. In fact, more than 800,000 hair loss sufferers are currently seeking professional anti-hair loss treatment or are experimenting with over-the-counter shampoos, conditioners, essential oils, supplements, medications or other hair loss treatments. Although some of these treatment options may work for some individuals, not everyone will see the same success. Not only do natural hair loss products help combat hair loss and help restore healthy hair growth, they are often more cost effective than other products or procedures, such as hair transplants. In fact, one of the best (and probably most surprising) natural remedies to proper hair care is guava leaves. Boiled And Mixed Into A Complete Hair-Soothing Solution. You are likely wondering if guava leaves can really help healthy hair growth. We wanted to know, too, so we began doing some research behind the benefits of guava leaves as well as the impact of guava leaves on hair growth. Guava fruit is a sweet tropical fruit that comes from the Guava tree that grows naturally in Mexico, Central, and South America. The Guava fruit is scientifically classified as Psidium guajava, which is also known as the white guava or lemon guava. The Guava fruit and the guava tree leaves are packed with many vitamins and nutrients, including Vitamin B2, Vitamin C, Potassium, dietary fiber, Vitamin A and lycopene, all of which are essential for healthy hair growth. In fact, the Guava fruit contains more Vitamin C than an orange. Additionally, Vitamin B2 specifically helps to repair cells and tissue in the body. This can be beneficial for restoring healthy hair, nails, and skin for all hair and skin types. Guava tree leaves can also help those with curly, wavy or frizzy hair with manageability. Guava leaves act as a strong and deep conditioner. Guava leaves can help not only strengthen hair but also the hair follicles, which promote thicker, stronger, shinier and healthier hair growth. Another benefit to using Guava leaves is that they are 100 percent natural. These natural ingredients provide the hair and scalp with necessary nutrients to build a solid foundation for healthy hair growth over the long term. Unlike other treatments found in drug stores or medications suggested by doctors or medical professionals, there aren’t any harmful chemicals or additives in Guava leaves. Although these products offer a “quick fix” for hair, they often result in long-term issues and can even worsen thinning hair and/ or hair loss. So, unless you have a specific allergy to Guava, then you likely won’t notice any negative, harmful or adverse side effects from using Guava leaves. Even if you aren’t convinced that boiling guava leaves and pouring them on your hair and scalp will stimulate healthy hair growth, simply eating Guava fruit or drinking Guava tea on a regular basis can do wonders for your overall health. The high level of antioxidants and anti-inflammatory agents in the Guava fruit provide a number of health benefits. Eating Guava fruit regularly can help trigger weight loss, support digestion, help treat Diabetes and maintain blood sugar levels, and improve cholesterol as well as reduce blood pressure. You may be wondering how to use guava leaves for healthy hair growth. In order to see maximum benefits from Guava leaves, simply boil a handful of Guava leaves in water for approximately 20 minutes. Once the water reaches a boil, allow it to cool to room temperature prior to straining the leaves. The essential restorative properties in the Guava leaves are transferred within water once boiled. When the water reaches room temperature, apply the leaves from root to tip. Be sure to massage it into your scalp and hair roots. It is best to apply the leaves to clean, product-free hair. Therefore, it is okay to apply to wet hair. The guava leaves act as a leave-in conditioner. You should treat their hair with Guava leaves at least twice per week in order to see maximum benefits and results. If you add this process to your regular hair care regimen, then you will likely notice fuller, stronger, thicker hair and reduced hair loss. If you put the solution onto your hair shaft regularly, the mixture will work to help reduce your hair loss. If you don’t have the time to boil Guava leaves several times a week, then there are some other ways to reap the benefits of Guava leaves. One way is to mix Guava leaves into your shampoo or conditioner. Simply make sure that you fully stir the Guava leaves into the shampoo and/ or conditioner evenly in order to ensure that you get the same consistency. You can also mix Guava leaves with other essential oils, such as olive oil, coconut oil or even honey. In fact, using Guava leaves with natural essential oils is a great way to reap the benefits from both the Guava leaves as well as the nutrients in essential oils. Additionally, mixing Guava leaves with essential oils can help apply Guava leaves naturally, evenly, and smoothly across the hair and scalp. Honey can even be used on its own to treat hair and help foster growth. However, when paired with guava leaves, the honey and Guava leaf mixture becomes a highly effective natural hair remedy to help treat hair loss and promote healthy hair growth. The essential nutrients from the essential oils provides hair with a deep conditioning treatment. Not only do Guava leaves combined with essential oils act as a deep conditioning treatment for hair, it also provides exceptional nourishment and a soothing, enjoyable experience. Now that you understand the benefits of Guava leaves and how they can be essential for promoting strong and healthy hair growth, where can you find Guava leaves? Read on for the best Guava leaf products, including Guava tea, and Guava shampoos and conditioners. Guava Leaves Are Rich In Vitamin B2 Which Aids Cellular Repair. Increasing Hair Growth By Nourishing The Scalp And Strengthening The Roots. Moisturizes Hair Without Leaving Any Residue. As mentioned above, Guava leaves are rich in Vitamin B2, which aids in cell repair. Sent From Earth Guava Leaf Shampoo is made with a number of organic essential oils, such as castor oil. Castor oil is a fabulous source of ricinoleic acid and Omega-6 fatty acids, which helps increase blood circulation. Increased blood circulation then leads to the scalp, which helps nourish hair follicles, strengthens roots, and allows for healthy hair growth. Sent From Earth Guava Leaf Shampoo is also made with Jojoba oil and Mustard oil, which are both full of antioxidants, and thoroughly moisturizes hair without leaving any residue or leaving hair feeling heavy, oily or greasy. Mustard oil is rich in Vitamins A, D, E and K, Zinc, Beta-carotene and Selenium. Macadamia nut oil is used in cosmetics and skin care because of its natural reconstructive and hydrating qualities. In fact, Squalene is a natural antioxidant in macadamia oil that helps to reduce oxidative stress on our skin and scalp. Additionally, macadamia nut oil also contains fatty acid content, which we also know adds shine, promotes hydration, and helps nourish the scalp and skin while also strengthening and nourishing hair follicles. Sent From Earth Guava Leaf Shampoo is easy to use. Simply apply a quarter-sized amount of shampoo to damp hair on the scalp, work up a lather, and smooth through to the ends. Allow it to sit on for 2 to 3 minutes for full absorption and deep penetration. 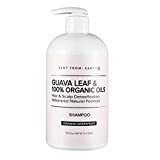 Sent From Earth Guava Leaf Shampoo is available for purchase on Amazon for $59, which is one of the most expensive products that we will review. However, the number of positive customer reviews prove that it is a quality, effective product that is well worth the price tag. Absorbs Excess Oils And Creates Body And Shine. Invisible Formula Leaves Hair Clean, Fresh And Full Of Body. Enriched With 100% Pure Natural Oil. Hempz Haute Mess Dry Shampoo is also known as “invisible” shampoo, which is designed to absorb excess dirt and oil from the hair and remove buildup on the scalp. The complete cleansing action provides hair with additional body and shine. The proprietary blend in Hempz Haute Mess Dry Shampoo is enriched with 100 percent pure natural hemp seed oil, and a number of other natural and organic ingredients. Hempz Haute Mess Dry Shampoo is designed for both men and women and all hair types. Hempz Haute Mess Dry Shampoo claims that it does not contain any sulfates or parabens, however, after reviewing the list above, it does appear that parabens make an appearance in this formula, as well as some other questionable ingredients. This leads us to believe that Hempz Haute Mess Dry Shampoo is a standard shampoo with a little hemp seed oil in it, and may not provide the full, long-term hair growth benefits as some other products. However, for the price, you can’t go wrong! So, how exactly does a dry shampoo work? Many individuals who have used dry shampoo enjoy using it simply for convenience. Dry shampoo can be easily applied to dry hair to help remove excess dirt and oils. After application, carefully use a towel to pat down hair and remove excess product. Then, style as desired. Hair will look and feel clean, just as if you jumped in the shower and washed your hair. Hempz Haute Shampoo is available for purchase on Amazon for $10, making it one of the most cost effective product options on our list. 100% Pure And Grown On Sustainable Family Farms. Each Bag Is Individually Wrapped For Freshness And Convenience. Supports Digestion And Healthy Blood Sugar Levels. Guava Leaf Tea comes with 120 individually wrapped tea bags, which is great for boiling and using on the hair and scalp and also promoting digestive health. Guava Leaf Tea is made with 100 percent pure and natural Guava leaves sourced directly from the natural Guava plant. The Guava plant is grown on sustainable farms and do not contain any additives or chemicals. Guava Leaf Tea comes individually wrapped in order to retain the fresh Guava leaves as well as for convenience. Individuals can easily pack the Guava leaf tea bags to take with them on the go. In addition to the many hair health benefits we have already explored with Guava leaves, Guava Leaf Tea can also be used as an aid to other bodily functions. For example, one health benefit of Guava Leaf Tea is that it can be used to help with Diabetes and even diarrhea. In fact, Guava Tea is also known as Diabetes tea as it can help support blood sugar levels and is caffeine free. It can also help support digestion; promote healthy bowel moment activities (and reduce or cure diarrhea) as a result from food poisoning, reduce blood pressure and even aid in weight loss. Guava Leaf Tea bags are easy and convenient to use and pack. They can be consumed hot or cold or added into shampoo and conditioner for full hair health benefits. 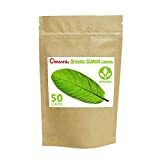 A box of 120 individually wrapped Guava Leaf Tea bags is available for purchase on Amazon for $18. Organic Omura Guava Leaves are another fresh Guava leaves product that can be used for brewing hot or cold tea as a source of dietary fiber or boiled and mixed into a complete hair-soothing solution. Organic Omura Guava Leaves are dried for tea. One bag of Organic Omura Guava Leaves contains 50 whole Guava leaves. There aren’t any additives, chemicals or artificial flavors including in this product. Organic Omura Guava Leaves are made from 100 percent organic Guava leaves to ensure freshness and a pure product. However, be sure to read the directions on the package. If you are using this product for creating a hair solution, it may require boiling several leaves. Because the package comes with whole Guava leaves, you may go through the package quicker than you thought. However, the whole pure Guava leaves are very effective in using as a quality hair health solution. 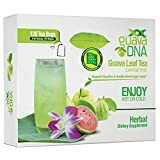 A package of truly Organic Omura Guava Leaves is available for purchase on Amazon for $10. All in all, Guava leaves can also do wonders for hair health, including cleansing the scalp, moisturizing and nourishing the hair from root to tip, and stimulate hair growth. We now also know that fresh Guava leaves are chock full of powerful antioxidants as well as anti-inflammatory agents, which makes them an excellent source of dietary fiber. Some of the health benefits of Guava leaves include treating Diabetes and maintaining healthy blood sugar levels, diarrhea (particularly associated with food poisoning), reduce blood pressure, boost weight loss and promote healthy cholesterol levels. In conclusion, clearly only good things can come from consuming or using Guava tea leaves. Because they are 100 percent natural Guava leaves and made from only the highest quality natural and organic ingredients, no harmful or dangerous side effects have been reported. However, individuals who have a known citrus allergy or who are prone to allergic reactions should try Guava leaves with caution. Can the tonic be stored and still retain its qualities? I have short hairs which means I don’t need the entire tonic for my hairs. Can I use it on my one year old baby? Where do I store the unused guava leaves solution…refrigerator or room temperature? It takes time like most Hair loss cures. Is the tonic drinkable is a tea? I do not know the safety of drinking this as a tea. You can store and re-use, we recommend applying it at least three times a week for best results. What time duration will it take to show promenant results? I have hair loss continued, but itz not sloved. Thank you for ur solutions I am trying also.. Please what tonic are u talking about? And where can I get some. Do I need any specific boul to store the tonic ?? No, any resuable container is perfect. How often the tonic should be used? Is the rinsing is must or can it left to dry up..
How many hours do I have to keep it applied on hair, if I m applying during the day. N then, do I have to jst rinse it off wd plain water or shampoo my hair to wash it away ? Hi, we recommend putting the product in your hair for at least 30 mins. You can shampoo and rinse to get the tonic out. I need to know if I need to shampoo my hair before applying the liquid. Or can I put it on and then shampoo my hair. Do you wash your hair before applying and then rinse it of after? Can I rinse the tonic next day after applying this?? Dr please reply can I use it on my 3 year old baby because her hair become thinner day by day? No, It is normal for a babies hair to fluctuate in thickness. Do not apply hair loss products to a baby. Can this tonic fill up the bald area ?? It has been proven to fill up the bald areas in some instances. From my knowledge I have not seen it in stores. Where can I buy guava leaves easily? would Walmart have these? or can you use Guava Tea bags, would this be an easier method to use and to buy? would it have the same effect? I’m looking to buy it for my mom…Thank you!! Any grocery store with a large produce section, or any asian markets will have it. Can i store it in the refrigerator? Can I apply it 4-5 hours before washing my hairs? What are the effects if i do not rinse it out? There are no side effects of not rinsing. How many times did i do this per week ?? Is it an everyday use ?? Does it have side effects if didn’t washed out when applied? In what container should the solution be stored like in plastic or glass bottles? And what is its expiry time? Yes you can store it in any reusable container, if you keep it in the refriderator you can use the mixture for up to two weeks, or until it goes rancid. A little mixture goes a long way. I keep mine in a plastic spray bottle in the refrigerator for over a month. I notice patches of mold growing inside. That’s when I discard the contents, clean the bottle and make a fresh batch. I’ve been using this formula three times weekly since August 2017 and have found little change in the thickness or color of my hair. My uncle has had success. His once white hair is now thicker and darker. You can keep in the refrigerator for a longer useage time. How long does it have to sit I was your head till you rinse? In some instances we have seen it be effective on bald scalps. i store the mixture but after 3 days, it had a weird smell….does it okay if i keep using it??? How long do you leave it in my hair before rinsing? Do I apply conditioner before or after using the mixture in my hair? We suggest using the mixture for at least half an hour, shampoo well, and then condition once the mixture has been rinsed out of the hair. can i keep this guava leave’s tonic on my hair for over night??????????? In the refridgerator is the best way to keep it fresh. How long do I leave in before rinsing out and what are effects if you leave in? Leave the mixture in for as long as you can before rinsing. We suggest at least half an hour. There is no side effects from leaving the product in for a longer time than recommenced as this is a natural product that cannot harm the hair . We recommend washing the hair before going out of the house or before an event, as your hair will look sticky and full of product. Keep the guava on your hair for as long as you can, at least half an hour. Absolutely ! You can apply the mixture, go to bed, and then wash in the morning. can it restore bald hairs? In some instances, application of fresh guava leaves can help to restore baldness. Please how long can it be stored for before it spoils or gets ineffective? Use fresh guava leaves for best results. If you want them to last longer, you can refrigerate the mixture. how long will it take to see noticable results? like how long for my hair to grow about 6 more inches? You should see results within three months. How long should I use guava leaves juice for my hair loss. And how many times should I apply it on my hair in a week or a day. We recommend a minimum of three times per day, and to leave it on for at least half an hour for best results. I’m sorry to hear that. Not all hair loss remedies work for every person. We have a wide range of other hair loss solutions that may be more helpful for his hair loss. Most people see results in three months. Keeping the product in the refrigerator is the best way to keep the product fresh and effective. Yes, and try to leave the product in for at least half an hour before rinsing. In some instances it can help, give it a try. You have nothing to loose ! Hi Naz, For best results I suggest using fresh guava leaves. Can you use dried leaves to make up the tonic? I have read the testimonials and how can I get the product. We suggest looking in organic supermarkets, asian grocery stores or health food stores for fresh guava leaves. Pls is it going to stop excessive hair shedding? Let us know how you make out ! how about extracting the juice of the guava leaves ( by pounding the leaves) and adding it to your shampoo? would it be beneficial this way? Ma’am do I need to apply the leaves after it gets boiled or the water. Can we apply oil after rinsing this guava tonic out? Is it ok to apply the tonic in a rebonded hair? Can I mix the boiled liquid from guava leaves with my hair oil so that I can use it as often as I can instead of the three times a day. This means I could apply a little every day. without having to rinse it off. Also may I know which guava leaves to use, the older ones or the young ones. I have a guava tree and its quite old. Hi! I would use the freshest guava leaves for best results. It will not harm you to add the serum more often than recommended! It may! Give it a try! Can i use dry Guava leaves? No you must boil them. Do I need to use a certain variety of Guava plant? My local nursery has the pineapple variety. I have only ever tried the regular guava plant strain. If I washed my hair with shampoo , can I directly use the guava leaves water to rinse my hair? Hi , Can i grind the leaves and put the paste and leave it for some time and then wash my hair ? Fresh leaf paste ? tonic will give you the best results ! Can i make a paste of guava leaves and apply ? fresh leaves..
After how munch time i need to wash the hair ? Where can i purchase guava leaves online? I HAVE NOT TRIED THE GUAVA LEAVES AND I AM GOING TO TRY IT. IS THIS GOING TO WORK FOR OLDER PERSON ? I WILL BE 74 YEARS OF AGE THIS COMING MARCH 2018. I recently have given birth to my first baby. And after this birth period, I have started to lose a huge amount of hair. I’m a breastfeeding mom and if I used the tonic is there anything to do with breastfeeding? Hope I will get the answer of mine too, looking forward to your answer. Pls can I use of on my relaxed hair? I’ve been reading of the wonders of guava leaves for falling hair. Now I’m trying out it. I’m from the Tropics, and just this week beginning to try this tonic, now that my Guava tree has grown and producing fruit. I boiled little at a time, (refrigerated excess), meaning, more concentrate in less water, and apply daily. I used to be a hairdresser(Canadian trained), and all hairloss products take 3mths before any difference to be seen. As for the application on wee ones, I’d not recommend either. Simply regular trimming of children’s hair will thicken as the baby hair grows out. My son was as bald at 2 as he was born. Today, I wish I had half of what he has.